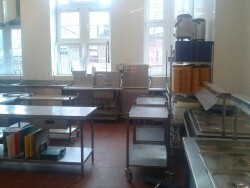 SCE have been selling catering supplies for many years specifically to Schools throughout the UK. We stock a large range of top brands such as Fosters, Dualit, Lincat, Moffat, Falcon, Tefcold. These are all priced extremely competitively and chosen especially for you. 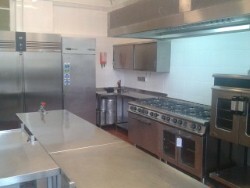 All catering equipment sold is selected because of it's high quality and performance. SCE Also supply full kitchen refurbs, from the initial Cad Drawing right through to the finished product including extraction, Flooring, Walls and electrical work. We can design a kitchen that suits you and feel that sitting down and designing the kitchen with your catering manager is the most important part of the process to ensure that you have a kitchen that is perfect. Please see pictures below of Kitchens that have recently been completed in August 2012. Northwold Primary School, Hackney (1st Pic) being a complete refurb. All existing equipment was removed including the old canopy (about 30 years old) and the walls and floors were repaired including all electrical work and existing and new equipment installed. Everything was bought up t date including extraction and gas interlock. 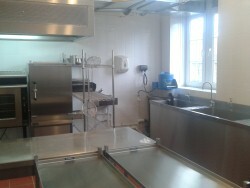 The kitchen was designed to suit the school catering manager and drawings were produced before any work was started. Stanley Primary School, Teddington (2nd pic) This kitchen was part of a new building. 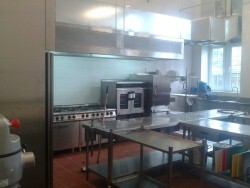 This large kitchen included a new extraction canopy and all new equipment including Rational Combi ovens and Fosters Fridges. This kitchen was designed to last. Please call us if you are thinking about refurbing your kitchen for an informal no obligation chat. We will be happy to come and see you to discuss your requirements.Please remember you can purchase your catering equipment on-line or if you would rather use your own purchase order system you can place your orders over the phone, e mail or fax. If you have a question about any of the equipment or there is something that you want that's not on our website, please feel free to call us at any time to discuss your needs and please make use of our useful recipes, menus and tips.